I adored painting this commission this little diva is just a joy to look at. 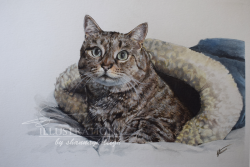 Her fur texture and colour was so much fun to paint she’s a beautiful tabby cat! I’m sure you will agree. Items used: Daler rowney paper 8.3×11.7inches & caran d’ache watersoluble coloured pencils.